TransLink is starting consultation about the options for the future UBC Line rapid transit service this evening. Early this morning there was “a special blogger breakfast” about the project. Jeff Busby and Margaret Wittgens from TransLink’s planning division gave a short presentation and were asked questions about the study and its work so far, plus the next steps for the project by about half a dozen people including Voony, Karen Fung, Nathan Pachal and Mike Klassen. We were given a package of materials – and all of that is on line at the Translink webpage. This is the second round of consultation on this project. As you may recall, in spring 2010, Translink consulted on alternatives for rapid transit along Broadway from Commercial Drive to UBC. Now, the project team has completed more design and evaluation work on the alternatives shown in 2010. And starting today, this detailed work will be presented to the public to get more feedback: that includes the potential routes, station locations, and other characteristics for each alternative. It is important to note that this process does not allow you to pick a favourite technology. There is a very extensive questionnaire to collect feedback (on line feedback closes on April 22) and that will come from the public workshops, and on line webinar (on April 4 at 7pm but you can preregister) and of course direct communications. For the google maps information you have to go to the Translink page – I have just clipped in a screen shot from that so the links in the table do not work directly. There is a great deal of information to absorb – and in particular I want to study the evaluation in greater detail. I also think that the discussion needs to be with Translink rather than comments here, so I have disabled commenting and pingbacks to this post. I hope that the people who have been so vocal about this issue will take the time to visit the web pages I have linked to, even if they cannot go to the meetings and I do encourage you to complete the feedback questionnaire once you have had the chance to digest all the information that is presented. I think is is also important to emphasize that Translink is in no position to build anything – or even run more conventional service at present. The next priority for capital investment is still the underfunded Evergreen Line. Not until this – and the next – phase of the study is complete will it be possible – in Jeff Busby’s words – for Translink to “decide how much money to ask for”. They are also in the process of once again updating the strategic plan which will now run out to 2045 and will determine the order of priorities for future major capital projects. That is the headline from the Daily Telegraph. That is not something I usually read – it’s a dreadful old Tory rag as far as I am concerned. And the reaction it chooses to emphasize shows that they really are stuck in the mid twentieth century. My first reaction was that is is a very sensible idea, but that a forty year time horizon is a bit unrealistic. Will there be any oil at all by then? Actually what they say is “no more conventionally fuelled cars in our city centres” which is not so much a policy as a prediction. And, of course, is rather more nuanced than the headline. There will be cars, just not cars as we know them, Jim. It is part of a broader transportation objective aimed at reducing greenhouse gas emissions – and, as is obvious, business as usual is not a feasible option. But the reasons for banning personal motor vehicles – however they are powered – go far beyond ghg and, it seems to me, are incontrovertible. Most European city centres have already got much further in reducing car use than we have. They have excellent public transport systems that they are still steadily expanding. 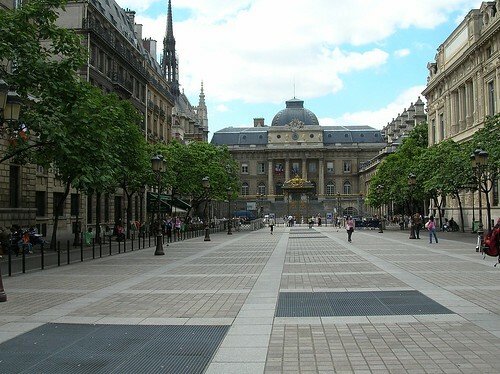 Everywhere there are car free streets and squares. Many have public bike sharing systems. In most major cities you can operate much better if you do not have to worry about a car, and the only time you might think about renting one would be for some rural jaunt. The progress that has been made in London since I left in 1988 has been remarkable – especially since I had spent the previous twenty years banging my head against the brick wall represented by the sort of ideas the Telegraph still espouses. If I had suggested electronic road pricing and a congestion charge I would have been laughed at. In fact I did and was. I even got into trouble for suggesting that Senior Civil Servants lose the privilege of parking on Horse Guards Parade – which has indeed been implemented. The tube network has been expanded, and an inner orbital railway – “The Overground” – opened. LIght rail came not only to Docklands but also Croydon – with on street running! There are bike lanes and bus lanes everywhere. And don’t forget even in 1988, 95% of the people in Central London got there by train. It’s not just within cities that things changed. They have high speed electric trains that cover the main lines to Scotland and the North – and now to Europe too. Commuter trains from Kent that are capable of 125 mph to fit in between the Eurostars. Passenger travel on Virgin trains on the West Coast mainline has doubled since they took over. It seems to me to be quite possible that London, Paris and Copenhagen could all ban internal combustion/fossil fuel cars in their centres much sooner than 2050. 2020 seems doable to me – and not at all unlikely just on “present trends continue”. The challenge for us of course is much harder. First of all, our “city centre” is tiny by comparison – and we have yet to grasp why building and widening freeways across the region might not be too clever. The Daily Telegraph could produce a Vancouver edition quite easily – those quotes could just as easily come from our established “elite”. And currently those ideas firmly hold sway – in both national and provincial politics. Just try to secure a small amount of space for cyclists and see what a ruckus that causes. Suggest we steadily reduce the amount of space devoted to cars in Vancouver – both moving and parked – and you will be looked at as though you are mad. Yet that is exactly what Copenhagen has been doing – for the past forty years! Paris is going to take the autoroute off the banks of the Seine and return it to the people. We can’t seem to grasp why taking down the viaducts should have been done years ago. I just came across this video recently posted at TED. The speaker is of course right about roundabouts – and, I think, misleading about traffic circles. As long as drivers adhere to the wrong headed “priority on the right” principle, they do NOT work. But he has a neat idea for minor roads at T junctions with major roads where the “all way stop” is just daft. Sadly WordPress does not allow me to embed this type of video.